DURHAM, N.C. — Young people who self-harm are three times more likely to commit violent crime than those who do not, according to new research from the Center for Child and Family Policy at Duke University. The study also found young people who harm themselves and commit violent crime — “dual harmers” — are more likely to have a history of childhood maltreatment and lower self-control than those who only self-harm. Thus, programs aimed at preventing childhood maltreatment or improving self-control among self-harmers could help prevent violent crime, the authors state. Rates of self-harm — deliberately harming oneself, often by cutting or burning — have increased substantially among adolescents in recent years both in the United States and the United Kingdom. In the U.S., roughly one in four teenage girls try to harm themselves and one in 10 teenage boys. In the U.K., the yearly incidence of self-injury among teenage girls has risen by nearly 70 percent in three years. In the study, published in The American Journal of Psychiatry, Richmond-Rakerd and researchers from Duke and King’s College London compared young people who engage in “dual-harm” behavior with those who only self-harm. Participants were from the Environmental Risk (E-Risk) Longitudinal Twin Study, a nationally representative U.K. cohort of 2,232 twins born in 1994 and 1995 who have been followed across the first two decades of life. Self-harm in adolescence was assessed through interviews at age 18. Violent offenses were assessed using a computer questionnaire at age 18 and police records through age 22. Researchers also found that those who committed violence against both themselves and others were more likely to have experienced victimization in adolescence. They also had higher rates of psychotic symptoms and substance dependence. After incidents of self-harm, clinicians should routinely evaluate a person’s risk of suicide. Clinicians should also assess a person’s risk of committing acts of violence against others. Improving self-control among self-harmers could help prevent violent crime. Self-harming adolescents should be provided with self-control training, which may reduce further harmful behaviors. 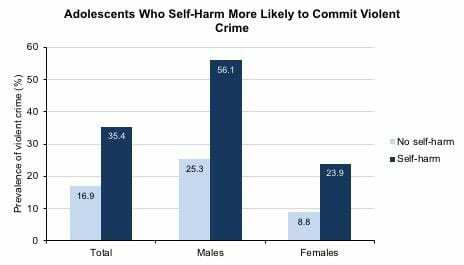 Self-harm and violent crime have largely been studied separately within the fields of psychology, psychiatry and criminology. Interdisciplinary research should be pursued, since it could yield new insights. This research was supported by the National Institute of Child Health and Human Development (NICHD) (HD077482), the Jacobs Foundation and the Avielle Foundation. Leah S. Richmond-Rakerd was supported by a postdoctoral fellowship provided by the NICHD (T32-HD007376) through the Center for Developmental Science at the University of North Carolina at Chapel Hill. The E-Risk Longitudinal Twin Study is funded by the UK Medical Research Council (grant G1002190).